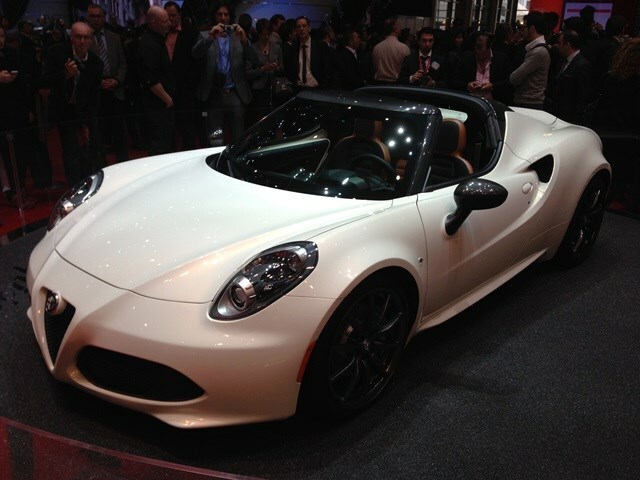 The star of the Alfa Romeo stand was undoubtable – the stunning 4C Targa broke cover. Based on the coupe version of the car, the open-top model features the same engine and gearbox combination of a 1,750cc turbocharged four-cylinder petrol unit coupled with a six-speed automatic gearbox and rear-wheel drive. It has 240bhp and will cover 0-62mph in 4.5 seconds. The exterior is similar, though the somewhat contentious headlights on the coupe model have been redesigned from a more aesthetically pleasing style. Find out more about the 4C coupe by clicking here. Also on show was a pair of new Quadrifoglio Verde models – the Mito and the Giulietta given the hot hatch treatment. The former uses a moderately powerful 168bhp 1.4 TwinAir turbocharged petrol engine with a six-speed automatic gearbox, while the latter makes use of the same engine used in the 4C, with 237bhp, and uses that same six-speed auto gearbox. Both send their power to the front wheels.